Paula Fitzsimons has spent her career tirelessly focused on creating opportunities for others. From working her way up through the IDA, then launching her own company Fitzsimons Consultancy to founding Going For Growth, her goal has always been the same: “I wanted to make a real difference by focusing on entrepreneurship”. Paula joined the public sector as a young graduate and soon moved to the IDA. Her time there was crucial as she found her calling and really believed in what they were trying to do, “which was creating employment for many of my contemporaries, who were leaving Ireland. Because at that stage we had a very high unemployment rate”. Paula took a brief career break when her children were young, completed an MBA and on returning to the workplace was asked ‘what do you want to do?’. “I had actually never thought about that before because I responded all my life to what other people wanted me to do as opposed to what I wanted to do”. This realisation lead to a turning point in her journey. Paula started Fitzsimons Consultancy in 2000. The company undertakes consultancy assignments in the area of entrepreneurship, growth and sectorial development strategies for a range of public sector and private clients. A ‘light bulb moment’ occurred whilst working with Enterprise Ireland. Paula came across the Global Entrepreneurship Monitor (GEM) report and realised the potential for Ireland to be part of it. At the time only 10 countries participated in the report whereas that number has now reached an impressive 73! 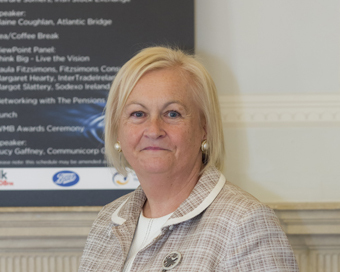 Paula became the national coordinator for the GEM report in Ireland and subsequently received the support of DCU Ryan Academy for Entrepreneurship. GEM has been funded by Enterprise Ireland since 2001. Other stakeholders such as Forfás, the Gender Equality Unit (part of the Department of Justice and Equality) and AIB have provided additional support over the years. The report is now well established within Ireland and is often quoted by government ministers, policy makers and the media. It was from GEM research that Paula first confirmed figures on the gender gap between men and women establishing businesses. “It was about 2.5 to 1 in favour of men, but doing that year-on-year I began to ask more detailed questions of the figures and in 2006-2007, I identified the real gap was not about the number of startups but about the aspiration for growth”. Paula successfully secured the tender. Her business model was to identify a high ranking businesswoman like Anne Heraty (founder and CEO of Cpl) and pair her with a female entrepreneur at an earlier stage of business development. Unfortunately successful female entrepreneurs were not too visible at the time and Paula soon realised she couldn’t cultivate a one-on-one relationship which was her initial plan. Rather she needed to get entrepreneurs around a table so that she could leverage the ‘lead’ entrepreneur with a number of participants. Her first action was to approach those women whom she considered to be her initial ‘lead entrepreneurs’ – capable and willing to mentor the participants. For the pilot of Going For Growth, she had 60 participants and eight voluntary leads (of which Anne Heraty and Rita Shah (founder of Shabra Plastics/Recycling) were the first) who gave freely their time over the course of six months to consult and mentor the participants. Brilliant businesswomen such as Mary Ann O’Brien (Founder, Lily O’Brien’s chocolates) and Amanda Pratt (Creative Director, Avoca) also took part. That was seven years ago and since then Going For Growth has produced many successful participants across six cycles. The programme was recognised in the EU Good practice initiative in 2009. Paula has hosted a National Forum annually and earlier this year piloted the programme in Finland. To gauge the programme’s success you only have to visit the website and read the glowing testimonials from past participants such as Birgitta Hedin-Curtin, Burren Smokehouse; Maeve Kneafsey, Elucidate; and Marissa Carter, Cocoa Brown Tan to name but a few. None of it would be possible though without funding, which is provided through sponsorship by The Equality for Women Measure, part of the Department of Justice and Equality; Enterprise Ireland; and more recently KPMG. Paula’s vision is that “those who become extremely successful with the support of Going For Growth will in time become sponsors because that makes it sustainable, and it’s all about giving back and is based on collaboration”. While planning the next cycle, Paula is also running her consultancy and overseeing GEM. Juggling three roles at once can sound overwhelming but “when you have a clear vision of what it is you want to achieve that actually helps you to drive forward”. She surrounds herself with supportive people, whether family members or the team around her “who believe in what I do”. This month, Going for Growth are seeking particpants for the seventh cycle of the programme. Ideally the candidates will be ambitious women running or managing an Ireland-based business, of which they are the major shareholder or a key influencer and it should be at least two years old. Anybody interested should visit www.goingforgrowth.com.